The Bank was first established in 1808 by George Rolph, an attorney. It initially traded under the name of ‘Rolph & Co’ and was located in premises at 11 High Street, where Coffee#1 now trades. The archives of the Royal Bank of Scotland shows the bank in Thornbury traded under various names in the early years as the partners in the bank changed. These included: Rolph & Co in 1808, Rolph, Yates & Co by 1810, Rolph, Yates & Parslow by 1812, Parslow, Rolph & Co by 1820 and Rolph, Yates & Parslow by 1841. Until the 1844 Bank Charter Act, privately owned banks were free to issue their own banknotes and by 1825 the bank was issuing its own banknotes in Thornbury. The bank survived the financial crises in the 1820’s when many other banking firms failed. In 1840 on October 2nd the Bristol Journal had an account of a highway robbery at Alveston, which involved an attack on Samuel Parker of Woodhouse Down. It was reported that amongst the property that was stolen was a “Thornbury bank-note for £5, no 1,828.” Obviously the notes were all traceable in theory although there seem to be a lot of them in circulation. On August 21 1844 a newspaper account of the consequences of the Bank Charter Act and the consequent monopoly then acquired by the Bank of England refers to the bank in Thornbury as “Rolph Yates and Parslow”. On the same day, August 21st 1844 The Standard (which became the London Standard) listed the returns of Provincial banks. The Thornbury Bank of W Rolph, F Yates and J Parslow appears to have issued £10,026 of notes. At some time the bank became a partnership between George Rolph, Joseph Yates, Edward Wilkins and Joseph Parlsow but by about 1855 Edward Harwood became involved with the bank and a new partnership was formed between Edward Harwood of Woodhouse, John Hatcher of Marlwood Grange and Joseph Sams. On September 22nd 1855 “E Horwood” was called upon to confirm that a Miss Smith came in to the bank with a Bank of England note for £10 which was forged. Mr Sampson a surgeon from Berkeley was accused of uttering this note knowing it to be forged. The Bank appears to have thrived and the premises on the east of the High Street was too small for them. The new owners bought up the White Hart on The Plain and replaced the old building with a new bank building. The Bristol Mercury of 27th February 1858 reported under the heading ‘Thornbury’: ‘That ancient and once famous hostelry, the White Hart, in this town, and some adjoining premises are now being pulled down, to give place to a handsome bank with manager’s residence etc about to be erected by Messrs Harwood, Hatcher and Co. The extended business of the firm requiring a more commodious building than the present bank, the new edifice is to be erected as speedily as possible. The following, after strong competition, have been selected as the contractors for the work, viz: Mr George Hopkins of Alveston, for carpenter’s work, Messrs T & R Ann of Thornbury mason’s ditto, Mr Charles White of Thornbury, plumbing, glazing gas-fitting etc and Mr Mark Ann of Alveston plastering and painting‘. The resulting very attractive bank is shown at the top of this page. 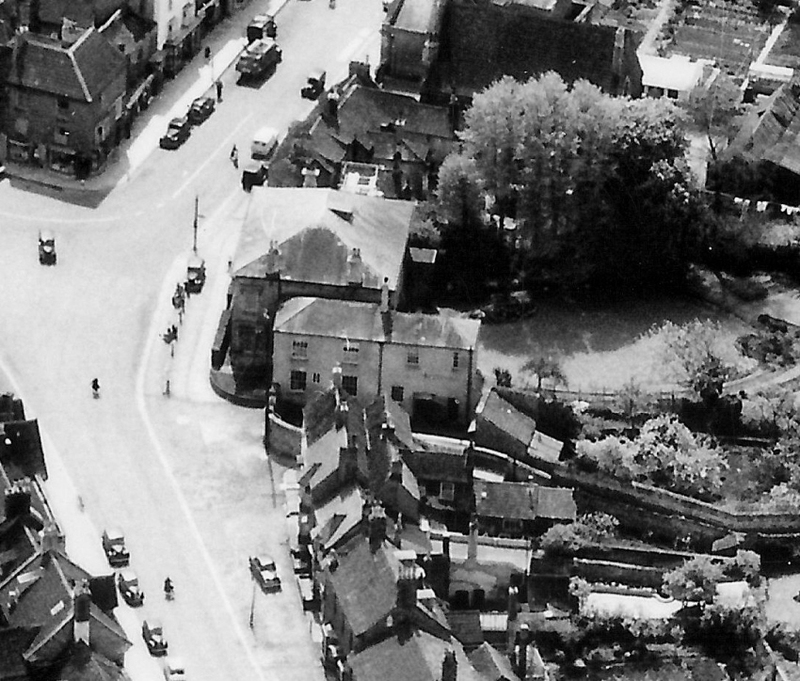 We have on the left here an aerial photograph of Thornbury which shows what must have been the accommodation at the side of the bank. It looks almost like two separate houses. We do not know the date of this photograph, only that it was before 1956 and after 1924. The rear of the bank had a very attractive garden, signs of which remain to the present day. 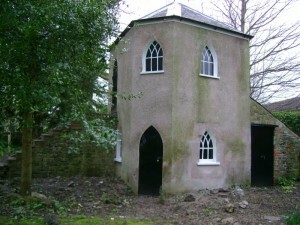 At the far end of the garden is an interesting building about which at present we know very little. We would be grateful to hear more about the date of this building. Mr Harwood was involved in other banks. There is a notice in the Bristol Mercury of May 10th 1862 that the Clevedon Bank started by Messrs Harwood is not a branch of the bank at Thornbury but a separate and distinct business. An article of January 1863 refers to another business of Mr Harwood and makes clear his position in the Thornbury Bank: “A circular issued this day by Messrs. Harwood, Knight and Allen notifies that they have commenced business as money dealers and discount agents. Mr Harwood is the senior partner in the Thornbury Bank and John Knight and Mr Joseph Allen have been engaged the former for 30 years and the latter for 22 years in the offices of Messrs A and G Alexander and Co.” The Western Daily Press of 15th August 1907 announced the death of Edward Harwood who was buried at Olveston and who on retiring from banking had become famous as a sheep breeder at his home at Woodhouse. Joseph Sams – the 1859 rate book and the 1861 census shows Joseph Sams, one of the Bank’s partners, was living at the bank. It describes Joseph as a banker aged 52 living with with ‘Sophia Elica’ aged 37 and their children: Mary S aged 10, Helen S aged 7, Arthur J aged 5 and Caroline L aged 3 and Frederic Sams, brother in law aged 34, proprietor of houses, gentleman born in Darlington, Mary L Jacob a governess aged 20 from Gloucester, and Sarah Oliver a nurse aged 21 from Somerton, Somerset. Joseph was born in Somerton, Somerset about 1809, the son of John Sams and his wife, Hannah (nee Motley). In the 1841 census he was a banker in the Market Place in Somerton. In 1846 Joseph married in the Bedminster area of Bristol. His wife was Sophia Elizabeth Sams, his first cousin. Sophia Elizabeth was born in Darlington in 1823, the daughter of a famous orientalist, Joseph Sams, whose life is described in the box below. Note his only known connection with Thornbury was through his daughter. JOSEPH SAMS (1784–1860), orientalist, born in Somerton, Somerset, was educated at Ackworth school, Yorkshire, from 1794 to 1798, and became a teacher there in 1804. He was described by one scholar there as being ” a fine old English gentleman, who wore a three-cornered looped hat called a three-decker buckles to his knee-breeches, and also to his shoes,” all of which gave dignity to his appearance. He left in 1810 to start a school at Darlington, but relinquished it to open a bookseller’s shop. Later he travelled over the continent of Europe and elsewhere in search of antiquities. During his many visits to the East he formed a valuable collection of Egyptian papyri, mummies, and sarcophagi. The objects were intelligently collected to show the workmen’s method, and included half-finished inscriptions, palettes with the colours prepared, and children’s toys. Among the jewellery was said to be the ring presented by Pharaoh to Joseph. In the course of his visits to Palestine, Sams visited every spot mentioned in the New Testament that could be identified. In 1832 he obtained from a banker in Girgenti 150 Græco-Sicilian vases of much interest, which he exhibited and described. Sams was somewhat eccentric and secreted the money for which his circular notes were changed in a screw ferrule at the end of a walking-stick. He carried with him religious books and tracts in Italian, Arabic, and other tongues. When granted an interview with Mohammet Ali at Alexandria he gave him a copy of the scriptures, and deposited another in the monastery at the foot of Mount Sinai. Sams’s curiosities were exhibited at 56 Great Queen Street, London, and at Darlington. Many collections were enriched from them. The bulk, which was offered to the British Museum, was purchased by Joseph Mayer about 1850, was exhibited with his own collection in Great Colquith Street, Liverpool, and in 1867 presented to the town by him. Sams died on 18 March 1860, and was buried at Darlington. He married, in 1807, Mary Brady of Doncaster (d. 1834). His books, pictures, tapestries, and manuscripts, were sold by Messrs. Puttick & Simpson in London on 2 Nov. 1860. In 1841 Sophia Sams had been living in Northgate, Darlington where she was shown as being ‘Independent’. In 1851 Joseph and Sophia were both living in the Market Place in Somerton. Joseph was the Manager of the West of England Bank aged 42. Sophia was aged 27 from Darlington. They had a daughter, Mary Sarah aged 2 months. Another daughter, Helen Sophia was born in Somerset in 1854. They must have moved to Thornbury shortly after as their son, Arthur Joseph was born there in September quarter 1855 and Caroline Lucy followed in June quarter 1858. Joseph died in 1862. In Joseph’s will dated 15th April 1862 he made several bequests to members of his family, friends and to two religious societies. He left £1000 for the endowment of a British and Foreign School in Thornbury. He left his one-third interest in the Bank to his wife, but we note that the partnership with Joseph Sams was officially dissolved in 1862. We don’t know whether Joseph took this step before his death or whether Sophia decided to have no further involvement in it. The firm continued as Harwood, Hatcher and Co. until the retirement of John Hatcher of Marlwood Grange in 1885. A newspaper article of 27th June 1866 featured the news that the Thornbury Bank of Messrs Harwood Hatcher and Co and the Clevedon Bank transferred their accounts to the London and Westminster Bank. We don’t understand the implications of this news and would be grateful to hear from anyone who can explain it to us! The 1871 census shows Sophia living at 7 Woodhill, Portishead with her three daughters. The census notes that her daughter, Caroline had been an imbecile since birth. Caroline died in 1876 and her death was registered at York. The 1881 census shows Sophia, Mary and Helen living at Lanherne, in Bathwick off income derived from dividends and rents. Strode Smith – the 1871 census shows that Strode Smith was living at the ‘Thornbury Bank’ as it was called. He was chief clerk, unmarried aged 43 from Axbridge, Somerset living there with unmarried sisters, Letitia aged 47, Martha aged 38 and Esther aged 31, all described as ladies with income from dividends, and all born in Axbridge. Strode and his sisters were some of the children of George Smith, a draper in Axbridge and his wife, Mary. In 1851 Strode was a banker’s clerk living with his widowed father at The Square in Axbridge. In 1854 he was at the West of England Bank in Axbridge when he advertised the sale of his father’s drapers shop and house and another dwelling in Axbridge. In the 1861 he was living with Letitia and other sisters in Mathon, West Malvern, where he was described as a ‘late Bank Manager’. 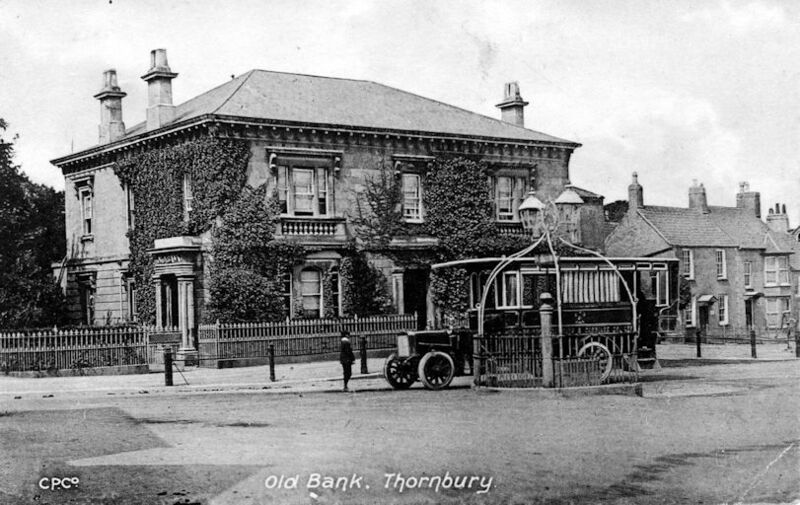 Strode and his sisters were all still living at the Thornbury Bank in the 1881 census, although Strode had now become the Bank Manager. The 1891 census shows that they were still there. Strode Smith died on 1st September 1892 aged 64 years and he was one of the first to be buried in the new cemetery in Kington Lane. We understand Strode was a Quaker. In February 1891 the Pall Mall Gazette reported Edward Harwood retiring from his business in the city but also described him as sole proprietor of the Thornbury Bank. On July 19th 1891 an announcement appeared to the effect that “Messrs Harwood and co of the Thornbury Bank have decided to transfer their banking business to the amalgamated bank of Prescott Dimsdale Cave Tugwell and Co which includes the well-known and popular Old Bank in Bristol. In 1891 the Harwood & Co. Bank was purchased by Prescott, Dimsdale, Cave, Tugwell and Co Ltd for £9000. We have read report saying that this ended Edward Harwood’s association with the Bank, another report says that he continued to manage the Thornbury Branch. In 1903 Prescott’s Bank Ltd amalgamated with the Union of London and Smith’s Bank which subsequently amalgamated with the National Provincial Bank Ltd in 1918. Click on the thumbnail on the right to see a photograph taken inside the Bank in 1913. We believe that the man at the nearest desk is Frederick Charles Sidwell who worked at the Bank at that time. Frederick’s family believe that he met Stella Beatrice Phelps who was also working at the Bank and they married . Edward Richard Dolling – the 1907 voters list shows Edward was living there and he is shown as Bank Manager in 1914 directory. Edward was baptised on 10th October 1852 in Amersham Buckinghamshire. He was the son of Thomas John Dolling a house decorator. The 1861 Census shows that he was aged 9 and boarding in a house in Clewer in Berkshire. By 1871 the Census showed that he was a clerk in the City of London where he was boarding with another clerk, John Fox Allen. On April 22nd 1878 he married Caroline Mary Davies the daughter of George Palmer Davies a perfumer in Surbiton. He was a bank clerk in Kingston upon Thames in 1881. In 1891 Edward was a bank clerk living in Lincombe and Widdecombe near Bath. He was aged 38 born in Amersham, Buckinghamshire, and married to Caroline Mary who was 41 and born in Islington in London. They had one daughter, Winifred A. aged 9 who was born in Kingston on Thames. They had another daughter, May Asprey, born on 27th June 1892. Caroline died in 1893 aged 44 and Edward re-married in June quarter 1896. His second wife was Alice Pryor who was born in Bath. In the 1901 census they were living at Monkton Combe near Bath. Edward was working as a banker’s agent aged 48. Alice was aged 37. They had had a son, Herbert born in the Bath area on 16th April 1898. Another son, Edward Hartley was born in the Bath area on 16th February 1902. They must have moved to Thornbury by September 1906 when their daughter, May, started at Thornbury Grammar School. Her siblings, Herbert and Edward were also educated at the Grammar School. The 1911 census shows Edward and Alice living at the Bank in Thornbury with their sons Hebert and Edward Hartley. In 1913 Edward’s daughter Winifred Anne by his first wife Caroline died in Aston in Warwickshire where she had been working as a ‘lady nurse’. Edward’s son Herbert was reported killed in France on 27th August 1917. He was serving as a Private with the Royal Warwickshire Regiment. Edward and Alice’s names appear in the 1918 electoral register for Thornbury, but they must have moved shortly after to live in Bath. Their address noted on the Commonwealth War Graves website was 9 Devonshire Buildings, Bath. Edward of 6 Victoria Place died at the City Club Edgar Buildings in Bath aged 75 on 29th June 1928. A bronze memorial is displayed on the wall inside the Thornbury bank. This is dedicated ‘To the memory of the 2681 members of the staff of this bank who served in the Great War 1914 -1918 and to the honoured memory of the 415 who gave their life for their country”. We are not sure if any of the staff of the Thornbury branch were included in these numbers. Frederick Saunders Turner – the 1921 electoral register shows Frederick was living at the Old Bank with his wife, Bertha Marie. The 1923 trade directory shows the bank manager to be ‘Frank Saunders Turner’. Frederick married Bertha Muriel Ernst in the Willesdon area of London in June quarter 1910. They had moved to Keynsham by 1911 when their son, Peter F was born and they were still there in 1914 when Bettina F was born. Frederick was also the Treasurer of the Thornbury Rural District Council as well as being the Manager of the National Provincial Bank. In 1921 he was appointed Mayor of the Borough of Thornbury at the annual Court Leet. Alfred Ernest Williams and Hilda Williams – they were listed in the 1935 electoral register as living in the Old Bank House. We suspect that Alfred may have been the manager there for a short time, but have no confirmation of this. William Thomas Harries – the electoral registers from 1938 to 1954 show that William was living at the Old Bank with his wife, Kathleen. He is listed as Manager of the National Provincial Bank in the 1939 directory. The register compiled in 1939 in preparation for the War shows William living there as bank manager. He was born on 2nd November 1898 and acted as ARP Telephone Control Car Messenger during the War. Kathleen was born on 30th October 1904. They had Elizabeth Durham , a cook, and Sarah Davis, a housemaid, living with them in 1939. In 1958 they had moved to Park Leaze, Park Road and they were shown as living here in the 1961 and 1965 directories. Kathleen died in 1967 aged 62. William died in 1968 aged 69. In 1970 National Provincial Bank merged with Westminster Bank to form National Westminster Bank. The business of the new bank’s two offices in Thornbury was consolidated in 1978 at the former National Provincial Bank’s premises on The Plain.